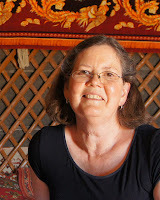 Dr Jean Mulder, who travelled with Uzbek Journeys in 2012 and is returning to Central Asia in 2014, is a senior lecturer in the School of Languages and Linguistics at the University of Melbourne. Nearly 230 artefacts from the National Museum in Kabul, Afghanistan, are currently touring Australia. 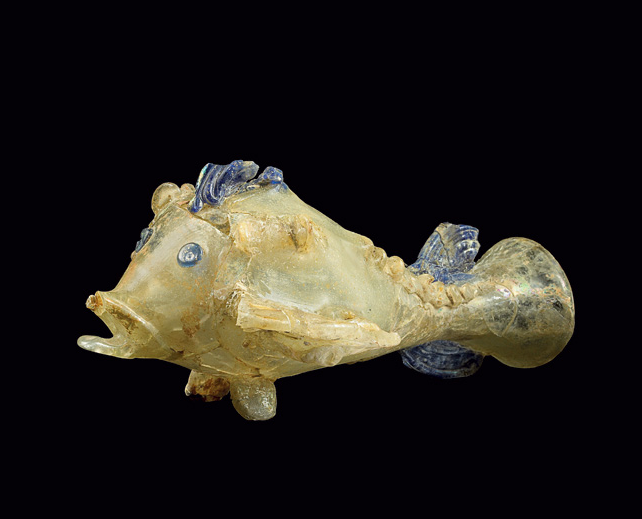 The archaeological treasures that make up this grand exhibit beautifully display ancient Afghanistan’s role as a key player in the exchange of goods and ideas along the trade routes of the Silk Road. Equally intriguing are the modern-day stories that are told of the artefacts’ discovery, excavation, and heroic rescue. The exhibit covers four archaeological sites. The oldest is Tepe Fullol, a Bronze Age oasis that was in full swing a long time before the Silk Road trade began. Large irrigation systems enabled oasis people such as those of Tepe Fullol to crop the northern Afghanistan desert plains, build fortified settlements and pursue artistic craftsmanship. On display are gold bowl fragments, dating back 4,000 years, which are decorated both with local motifs and designs from the distant cultures of the Middle East suggesting that even the people of this era were involved in long distance trade. The former Greek city Aï Khanum, the second site covered in the exhibit, is also in the region of northern Afghanistan which is known to the West as Bactria. Different cases bring to life various parts of the city, with the bronze, ivory and stone sculptures not only telling us about the legacy of Alexander the Great’s conquest of the Persian Empire (334-323 B.C. ), but also about the melding of local and other Asian ideas, products and culture in this far-flung outreach of the Greek empire. Regretfully, Aï Khanum, which was abandoned around 130 BC., is the only true Greco-Bactrian settlement that has ever been excavated. 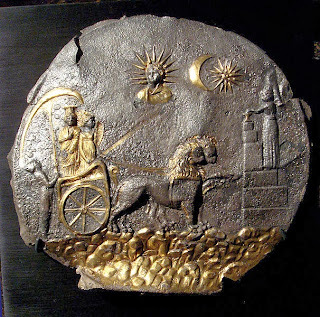 The greatest archaeological treasures found in Afghanistan, if not in all of Central Asia, are from the third and fourth sites, Begram and Tillya Tepe. And they are truly breathtaking. The experts are still debating whether goods in these two rooms are a royal treasure hoard or a merchant trader’s stock. In either event they give us an excellent view of the range and richness of the commodities being traded along the Silk Road at its height. 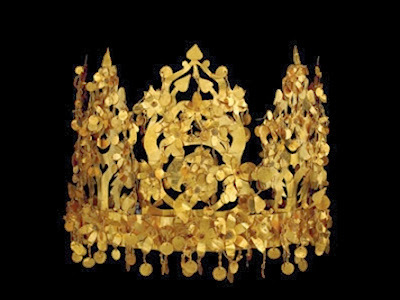 In some ways, though, the real highlight of the exhibit is the exquisite collection of gold artefacts from the famed ‘Bactrian Hoard’ – objects from the 2,000 year old graves of six Bactrian nomads discovered at Tillya Tepe ‘Hill of Gold’ in northern Afghanistan in 1978 but hidden from view until 2003. While the displays show the metamorphosis of Silk Road art into a unique, highly refined style with workmanship of exceptional quality, what is as remarkable is the story of the Afghan heroes who risked their lives to hide and protect these and other ancient treasures of Afghanistan’s past. I had the good fortunate to see this exhibit just before it finished in Melbourne. It not only left me very nostalgic for my trip to Uzbekistan, arranged by Uzbek Journeys, but it also gave me a greater understanding of the historical timelines and cultural significance of places and events that I learned about during my recent initiation to Central Asia. 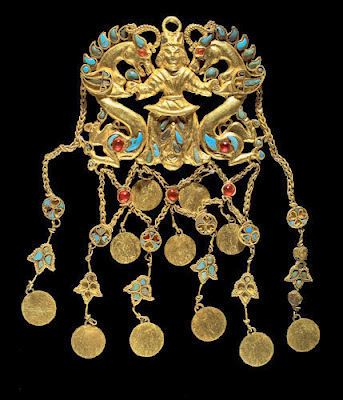 If you are travelling to Central Asia, whether for the first or the umpteenth time, or are interested in the cultural heritage of this region, the exhibit is a must-see. The catalogue is highly recommended.